Summer readers... do I have a treat for you! The SMS Wiki has been updated with a new look, refreshed resources and a new database! 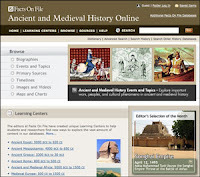 Click to visit our new access to Facts On File's Ancient and Medieval History Online. This fantastic resource focuses on ancient and medieval history. This tool will be available throughout the school year in the History section of the Digital Resources page of the wiki. The search interface is clearly organized and encourages browsing. Information seekers can browse by format: biographies, events, primary sources, timelines, images, videos, maps, charts and more. We can also quickly dive into 1 of 9 topics which are gathered by geographic location and time period. Visitors who know exactly who or what they are looking for can type their query into the search box. Results can easily filtered by Biographies, events and topics, primary sources, images and videos, and maps and charts. The results show the title of the article and name of the source. The articles are rich with detail and include links to related information within the database as well as suggestions for further reading. Don't limit your use of this (or any other) database to formal research reports! The videos and charts can be a beneficial visual aid for during instruction. Students can investigate beyond the textbook, gathering 1 or 2 quick facts related to classroom discussion. Compare information provided through primary and secondary sources. Compare information gathered through text, image and video. As a group discuss how you might learn more on a topic, paying special attention to resource and keyword selection. Encourage students to further explore a topic of study, just for fun.